This one-way fence option is used on Highway projects and also mineral quarry and development areas. It is extremely easy to install on-site. This one-way fence option is used on Highway projects and also mineral quarry and development areas. It is extremely easy to install on-site. 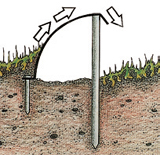 The system consists of curved fence panels supported by posts and ground pegs. The components are light and can be moved and installed manually. No machines are needed. Amphibians and small animals gain extra protection from the overhang when they move along the fence to the tunnel entrances. The surface they move along consists of natural soil and vegetation. On open ground animals are more shaded and less exposed to sunlight than with a vertical fence. 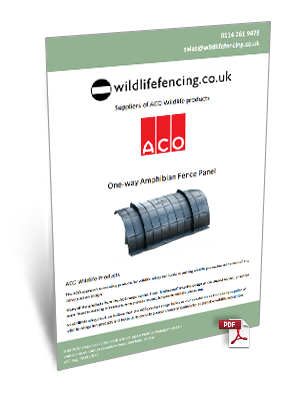 The simple geometry of the One-way fence includes a downward lip that stops small amphibians, reptiles and mammals from climbing over it and moving in the wrong direction. The curved shape on the other side is easy to climb and lets animals move away from danger to the safe side. 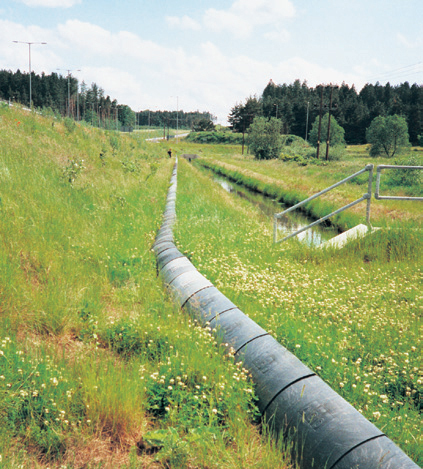 No major excavations are required for installation on site. The excess soil dug out to create a smooth strip for laying the Guide wall can be used to fill up the lower third of the fence at the back.